Depression is relatively common and may cause extreme symptoms that affect how you handle daily activities, including sleeping, eating, and working. To be diagnosed with depression, you need to have symptoms for at least two weeks. Symptoms may include a persistent sad or empty mood, irritability, feelings of hopelessness or worthlessness, moving slowly, difficulty concentrating, difficulty sleeping, appetite or weight changes, thoughts of death or suicide, aches and pains, and digestive problems that do not respond to treatment. Each case of depression varies in how it manifests. If your depression is job-related, our Boston workers’ compensation attorneys may be able to help you recover benefits. It may be especially challenging to recover workers' compensation benefits for job-related depression. The difficulty lies in showing that the mental condition is related to the job instead of some other reason, such as an organic illness. Any job has some amount of stress, and things like depression caused by a failure to get a promotion will not qualify you to get workers' compensation benefits. However, in Massachusetts, if you can show that your depression is a result of bullying, verbal abuse, or physical trauma on the job, you should be able to recover benefits. For example, if your manager has hit you or verbally abused you on a frequent basis, you could probably show the relationship between your depression and workplace or job conditions. Similarly, if you worked in a school that had a school shooting and suffered from depression, you could probably establish that it was job-related. People who work with prisoners often experience trauma and stress on the job, and it may result in depression that mandates workers' compensation benefits. These types of claims are especially challenging, due to the difficulty of proving a causal connection. If you are prone to depression or have experienced depression for other reasons in the past, your claim may be even more challenging but not impossible. You may recover benefits as long as a workplace condition or event is considered a major cause of your depression. You will need to present medical evidence that shows a well-developed causal nexus between what happened to you at work and your depression. If the cause is verbal abuse or bullying that is less tangible than a physical injury, it may be helpful to record in writing incidents that occurred, including the date and what happened. 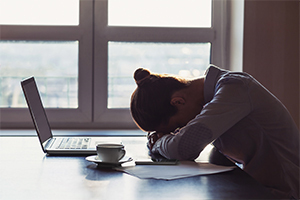 Often, insurers dispute that depression is a workplace injury, even when there is a visible physical trauma. It is important to be prepared for this possibility. You may be entitled to treatment for job-related depression, including medications, psychotherapy, or both. As soon as you realize that your depression may be job-related, you should notify your employer. If you are disabled or not able to earn your full wages for five or more calendar days, your employer is supposed to file a report of injury or fatality with the insurer in a timely manner. Depression may be debilitating and require substantial treatment. If you suffer from job-related depression, you are entitled to workers' compensation benefits. The Boston lawyers at Pulgini & Norton can provide sound advice and aggressive representation for your claim. We represent people in Quincy, Waltham, and Newton, among other Massachusetts cities. For a free consultation with a job injury attorney, contact us online or call us at 781-843-2200.